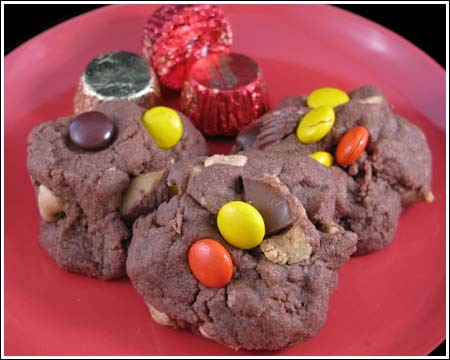 These are double chocolate cookies with both peanut butter and chocolate in the dough. In a large bowl (I used my KitchenAid mixer), cream together the butter, peanut butter, white sugar, and brown sugar until smooth. Beat in the eggs one at a time, then stir in the vanilla. Combine the flour, cocoa, and baking soda; stir into the peanut butter mixture. Mix in the chocolate chips, peanut butter chips, and Reese’s Pieces. Note from Anna: Recipe calls for regular butter and does not include salt. If you use unsalted butter, you might want to add some salt (generous half teaspoon) to the batter to keep the cookies from tasting flat.